Boxing has been and still is a widely recognized sport in the world. There are several categories practiced worldwide, such as heavyweight, middleweight, light heavyweight, cruiserweight, and even welterweight. Among the renown boxers are Deontay Wilder, David Benavidez, Jose Ramirez, Muhammad Ali and Kenneth Norton, just to name a few. 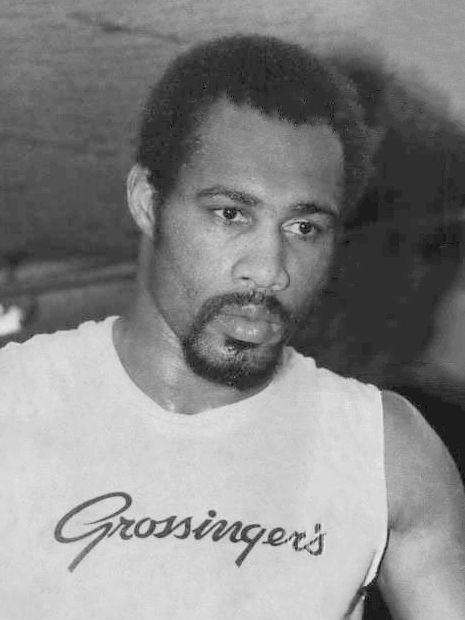 Born on August 9, 1943, in Jacksonville, Illinois, United States, Kenneth Norton was a renown American professional boxer. He competed from the year 1967 to 1981, whereby he won the WBC heavyweight title in the year 1978. 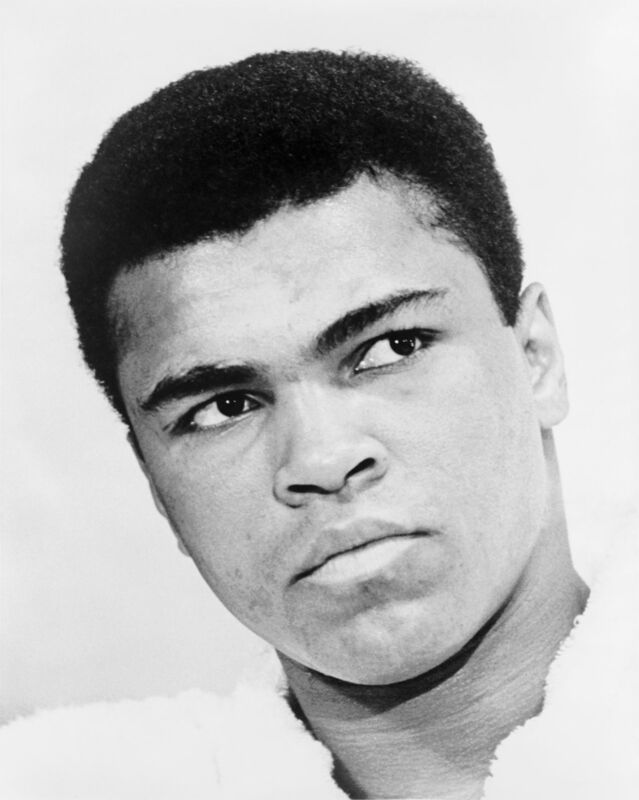 He is mostly reknown for his professional boxing fight with Muhammad Ali, in which he won the fight. In his boxing career, he played a total of 51 fights, with 42 wins, 7 losses, and 1 draw. Among the wins, 33 were by KO. He retired from boxing in the year 1981. He later died on September 18, 2013. Borrn on January 17, 1994 in Louisville, Muhammad Ali was a renown professional boxer, commonly referred to as the greatest of all times. He began training at the age of 12 years, and by the age of 18, he had won a gold medal in the light heavyweight category. In his boxing career, he played a total of 61 fights, with 56 wins and 5 losses. Of the 56 wins, 37 were by KO. He retired from boxing in 1981, at the age of 39, and later died on June 3, 2016. While Kenneth Norton was born on August 9, 1943, Muhammad Ali was born on January 17, 1942. Kenneth Norton was born in Jacksonville, Illinois, United States of America. On the other hand, Muhammad Ali was born in Louisville, Kentucky, United States of America. 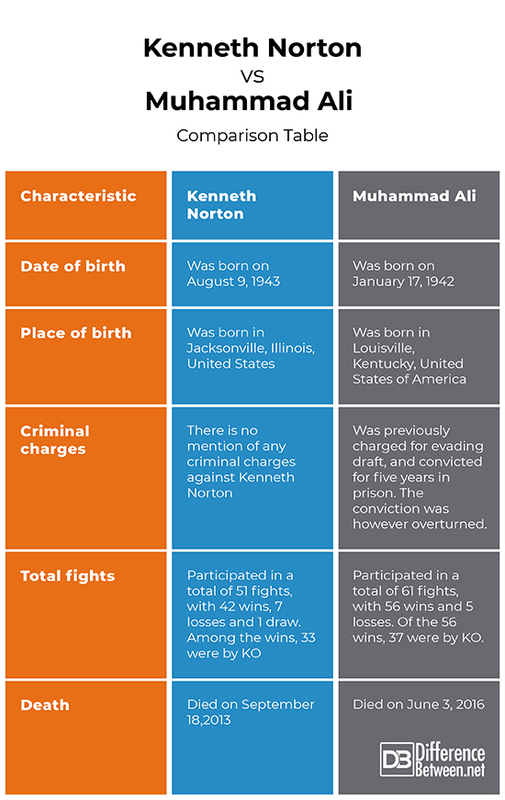 While there is no mention of any criminal charges against Kenneth Norton, Muhammad Ali was previously charged for evading draft, and convicted for five years in prison. The conviction was however overturned. Kenneth Norton participated in a total of 51 fights, with 42 wins, 7 losses, and 1 draw. Among the wins, 33 were by KO. On the other hand, Muhammad Ali participated in a total of 61 fights, with 56 wins and 5 losses. Of the 56 wins, 37 were by KO. Kenneth Norton died on September 18, 2013, while Muhammad Ali died on June 3, 2016. Both Norton and Muhammad have been instrumental in the shaping of the boxing sport. Despite their differences, they have inspired many people, not only in the sport aspect but also in other essential aspects of life. Tabitha Njogu. "Difference Between Norton and Ali." DifferenceBetween.net. April 1, 2019 < http://www.differencebetween.net/miscellaneous/sports-miscellaneous/difference-between-norton-and-ali/ >.